I’m not sure what this particular piece of furniture is called, but if I had to guess I’d say it was a dresser or chifferobe of some sort. It has had 2 doors, 2 smaller drawers and 4 large drawers. I picked this beauty up off the side of the street. From afar it looked almost new (according to its sticker it was made in 2007). I couldn’t believe someone actually threw it out. Upon closer inspection, I saw why. It had been very badly abused its owners. The drawer tracks were broken off, the doors ripped off. I thought it was worth a second chance. It’s kind of a work in progress as it is still in need of a more permanent solution to the broken drawer glides (I have to order them online.) Even with the messed up drawer glides, it’s still very usable, and now resides in my pantry as snacks/kitchen gadget storage. I even went out of my comfort zone and gave it a turquoise coat instead of my usual black, white or dark brown. I am very happy with the color, as it gives a shot of color to my soon-to-be-painted all wood kitchen. I will be adding baskets into the open cavities for a neater appearance. Apologies for the poor photo. I could’ve sworn I took a good before photo, but apparently I didn’t so I had to crop the dresser of another pic. Hey Girl, You really did a job on that one. I love it. Where are you ordering the drawer glides from? I need to repair the drawer in our kitchen. Maybe I’ll grow up and be a crafty Mama like you one day. I’m getting the drawer glides from http://www.rockler.com. Home Depot and Lowes have generic ones that you night be able to use though, so I’d check there first. Very nice! I’m hoping to find something similar to repurpose and make beautiful for my home. thanks for stopping by Melanie! Keep your eye out, you never know when you will find that perfect piece. I love that color! Great choice!! thank you! I guess it pays to step out of your usual, sometimes. I love the paint color you chose. It is so pretty. This piece looks great! It’s amazing what paint can do. Now I’m working on bringing color to the other side of the dining space that I didn’t choose to paint (for now). The wood is in really good condition so I let it go. I think I’ll use more fabrics and such on the other side. Ooh la la! Really lovely and it’ll be even more appealing with a few snacks on it. 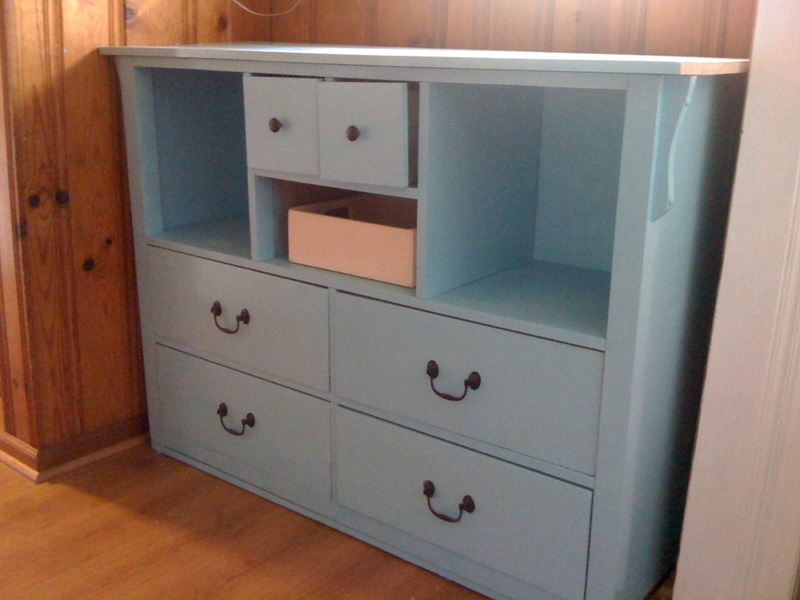 Ohh I absolutely love your dresser transformation! Found your blog via Nester’s National Risk Day! Great stuff-I’ll definitely be back!! Thanks! thank you for checking me out! I look forward to doing more of these, and I wll be sure to check you out too. Oh, I love this! Making over thrift store furniture is one of my favorite things to do. I usually don’t buy pieces with broken drawers…but I never knew you could buy drawer glides! Thanks for the info. I love it, Yetunde! The blue is amazing. It’s unbelievable what gets thrown out these days! @sia, yes it is amazing, we live in such a throw-away world, people often don’t consider whether something is worth fixing before discarding. I love love love that color. It’s so hard for me to step out of my comfort zone of brown or white. I think I might do the same and try something new!